Rep. Alexandria Ocasio-Cortez is doubling down on her stance that her native New York City is lucky that Amazon isn’t opening its HQ2 there, saying it would’ve hurt locals while blasting the tax subsidies granted to the tech giant. “There’s NO WAY that this deal – one of the biggest giveaways in state history – could possibly have been bad, right? Surely there can’t be anything wrong with suddenly announcing a massive restructuring & pricing out of a community without any advance notice or input from them,” Ocasio-Cortez tweeted on Tuesday, as part of a multi-tweet rant against Amazon. The freshman Democratic congresswoman bashed the “fuzzy proposal” for offering few guaranteed jobs to locals, while also criticizing the “big-brother-esque potential” of Amazon, sharing a Washington Post article on the company potentially working with Immigration and Customs Enforcement last year to use facial-recognition software to spot undocumented immigrants. Ocasio-Cortez also ripped pundits who said that she didn’t understand the $3 billion tax subsidies Amazon was set to receive from the state and city. “It’s fair to ask why we don’t invest the capital for public use, +why don’t we give working people a tax break,” she also said in a tweet. It’s a line Ocasio-Cortez has repeated multiple times in the last week. Soon after Amazon backed away from its plan, Ocasio-Cortez said on CNBC that the tax breaks given to Amazon could’ve instead been used to pay for more teachers or improve the subway system. “We were subsidizing those jobs. So frankly if we’re willing to give away $3 billion for this deal, we could invest those $3 billion in our district if we wanted to,” Ocasio-Cortez also said in the same interview. That thought process hasn’t been met with unanimous praise, however. Andrew Ross Sorkin, a financial columnist for The New York Times, adamantly criticized Ocasio-Cortez comments last week on CNBC, saying that the tax breaks would’ve been more than offset by Amazon bringing in more than $27 billion in tax revenue over the next quarter century. Amazon said it wouldn’t look for a new East Coast hub in place of its New York City complex, instead focusing on its planned expansion in Northern Virginia. For over a month, Facebook has been dealing with the PR nightmare sparked by its admission that the data of up to 87 million users was secretly accessed by consulting firm Cambridge Analytica, and later used to help Trump’s 2016 presidential campaign. The slip up sparked the #DeleteFacebook hashtag, in which people on Twitter and other spaces announce they’re doing precisely that. Facebook has tried to course-correct with new security measures, and CEO Mark Zuckerberg agreeing to testify before Congress. But that wasn’t enough to keep some A-listers from joining #DeleteFacebook. Here’s a look at the celebs that have dropped their profiles (so far). Elon Musk didn’t seem to hesitate when a Twitter follower dared him to delete the Facebook profile for SpaceX, his rocket company. The two accounts combined had about 5 million followers. Cher tweeted that it was “VERY HARD” to delete her account, because of the “amazing young Ppl there.” But delete it she did. If only Facebook could turn back time (I’ll show myself out). The Goddess of Pop must’ve been talking about her personal page only, however, because her commercial page is still live. Guess it’s hard to delete those 2.4 million followers. Alright, Woz didn’t technically delete his profile. The Apple co-founder said he was too worried about losing ownership of the “stevewoz” handle. But he deactivated the account, saying Facebook has a one-way relationship with its users. “The profits are all based on the user’s info, but the users get none of the profits back,” Woz told USA Today. 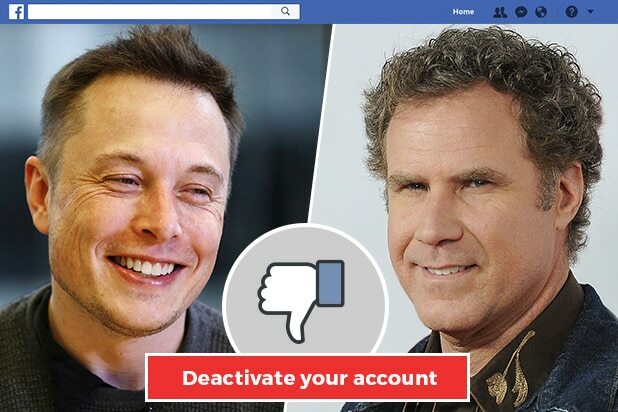 Deleting Facebook is so hot right now, at least according to Will Ferrell. The “Anchorman” star erased his profile at the end of March, saying on his page “Cambridge Analytica’s misuse of millions of Facebook users’ information in order to undermine our democracy and infringe on our citizens’ ‘privacy'” was the reason for his exodus. Singer Roseanne Cash, daughter of country great Johnny Cash, announced on March 29 that she would delete her Facebook account the next day. That remains to be seen, however: the page is still live as of April 9.